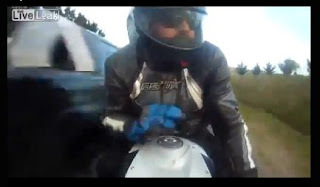 A biker and his passenger in Australia narrowly missed death when a light pick-up truck, possibly a Toyota Hilux passed inches, if not millimetres, away from them. Because the incident happened so quickly, you may have to replay the video a few times. It seems that the ute driver took a corner too quickly, thus causing him to wide-turn to avoid tipping over.